Implicit Regression is useful in measuring the constant nature of a measured variable ; it helps detect bivariate and multivariate random error; it is sensitive to incorrect modeling; and can handle co-dependent relationships more readily than standard non-linear regression [2,3]. There are two types of resulting analysis: Non-response Analysis and Rotational Analysis. Non-response analysis is where whereas Rotational Analysis allows for each term other than unity to be taken as the response variable in turn. The first use is the same in both standard regression and the non-response model defined under Implicit Regression which is the explanatory power otherwise referred to as the coefficient of determination, R2. This is the percent variance explained by the mean. This is a measure of the constant nature of a “variable”. Variable here is placed in quotations because as R2 →1, the smaller the variance and the measure is less variant and may be consider a constant, relatively speaking. The measure the explanatory power is the same using standard regression and non-response analysis with analytical forms. where the solutions to the non-response model does not depend on the sample size, but rather the base variance (Wooten R. D., 2016). Like turning the end of a kaleidoscope, these rotational views give more insight to the relationship that exist between the measures including the possibility of a co-dependent relationship that does not depend on the sample size. Consider the three rotations with σ = 2,5,10 in the four outlined cases, illustrated on the next page. Standard regression is shown in red and green; and implicit regression is shown in green. The larger the variance, the larger the pin wheel effect; however, when the relationship is non-linear, the effect is more pronounced. That is, comparing the graphics when there is small variance in a simple linear relationship, then the three rotations converge. However, when there is large variance or a non-linear relationship, the graphics show a pin-wheel effect. 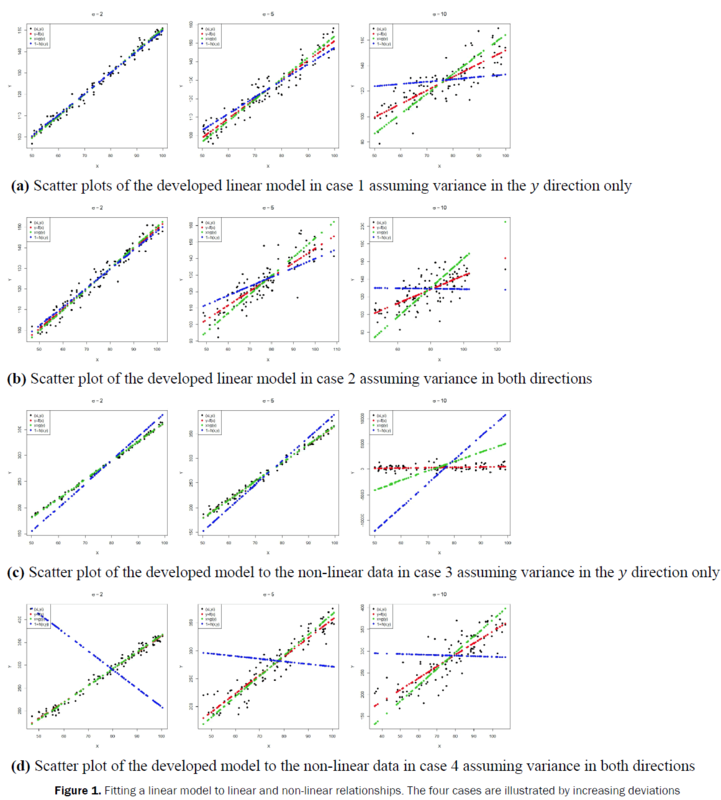 Implicit Regression enables the researcher to detect bivariate random error and model non-linear co-dependent relationships in multivariate analysis (Figure 1). Figure 2. 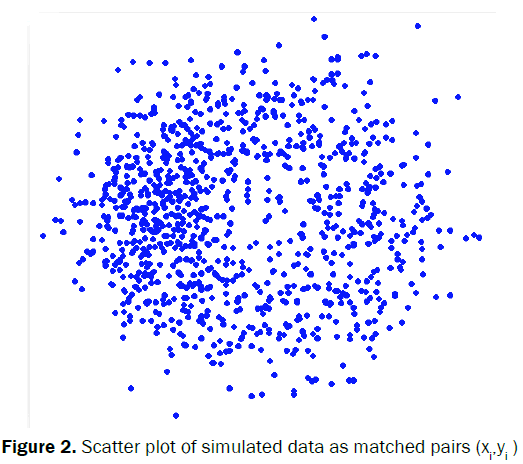 Scatter plot of simulated data as matched pairs (xi,yi ). The resulting solution shown in green, (Figure 3), is representative of the underlying relationship shown in red and the observed data in blue. Implicit regression also detected that the term xy was insignificant. SST = SSM + SSE. That is, when given where the model is of the form and the error terms are only taken for this single variable, does this relationship hold true. Moreover, you can assess the degree of separation between subsets of variables or all the variables as illustrated in the vector space below. The closer the degree of separation is to 90°, the stronger the independent relationship between the three measured errors.